Though this post strays a bit from my normal theme, I wanted to share this special experience with everyone that reads this blog! Anyone who knows me well, knows that I am generally tied into community events and that I was raised to be charitable with my time and money. 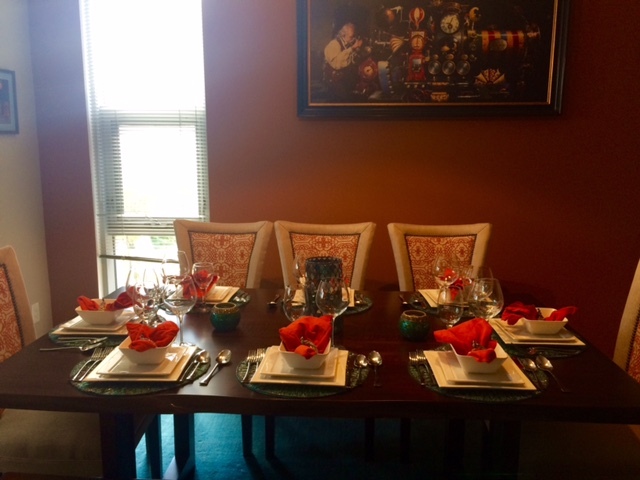 Several months ago, in an effort to help support and promote restaurant supported agriculture (RSA), I purchased an in-home dining experience for eight people. This dinner would be prepared by the owner and chef of Braise, Dave Swanson, and would include four courses plus wine pairings. I was beyond excited to invite some friends over to enjoy some great food – that I wasn’t going to have to cook! Fast forward a few weeks and know that Becky (general events manager at Braise) was absolutely wonderful to work with during the planning process. And, when the date finally came to have everyone over, Dave and a bonus chef, Jarid were extraordinary! I was able to scramble and get my table ready for company – except that this girl who LOVES fresh flowers and purchases them almost weekly, forgot to buy flowers for the table! EEK! They were prompt, polite, and fully prepared with coolers, tubs, and lots of gear! They were as gracious as can be and seemed to feel right at home in my (small) kitchen. Even I didn’t know what my guests and I would be dining on, but Chef informed me that he decided to throw in an extra dish and we would enjoy five courses plus wine pairings. Chef Jarid was kind enough to offer to email the menu in full detail since I knew I wouldn’t be able to do it justice (keep reading; you’ll see why!). They served us, explaining each dish in detail. Sometimes, it took a bit of patience as our dinner party was very conversational – yet, never a sign of frustration from Dave or Jarid. We started off being passed crustini appetizers (which I failed to photograph as I was greeting the final two guests to arrive). One of the things I love about my friends is that they prefer NOT to sit next to their spouses so they can get to know others in the group, so that’s what naturally happened. Once seated we were served homemade wheat bread, Parmigiano sticks, and Parmigiano-cayenne sticks, with Wisconsin butter. Then came the Roasted Sweet Corn & Summer Squash soup with olive oil cured pepper garnish and sambal oil. (Yeah, I had to Google a few things) This lovely soup was served with Prosecco to start the evening off. We were then served a “beets” dish. I have recently found myself loving beets – and it feels like the rest of the world was either ahead of me on this trend, or is on board the way I feel now. Our dish was a mix of yellow and red oven roasted beets served with white wine poached fennel, toasted walnuts, lemon chèvre, herb fennel vierge, and currant salt. Say that five times fast! The beets were paired with a Cuvee white wine. It was an amazing salad dish! Next, came the grilled Chanterelle mushrooms, Parmigiano custard (AKA: “I would put this on everything” – Christy), picked ramps, ramp jam, and ramp salt.These delights were paired with a Chardonnay. I have to say that with each subsequent dish, my dinner guests kept updating their favorites parts of the meal! Our fourth course was the “main dish”, I suppose. However, in my mind, each of these could stand alone as a dish I would fully enjoy! We were served roasted airline chicken breast, seared summer squash, candied pepitas, herb creme fraiche, and preserved lemon chutney served with an Italian red wine. Up until this point, we all were fully satisfied and had enjoyed each course immensely. When we were served dessert, we were surprised with a crazy, refreshing, and delicious dessert of Muskmelon mousse with compressed melon and served in a cucumber fennel broth with milk crumble (and, although I’ve never done drugs, I have to think this is the culinary equivalent of crack!). When paired with a sweet dessert wine, it was essentially perfection in a bowl! I’d better NEVER learn how to make milk crumble, or I’m in serious trouble! Because I had asked for permission, and Chef Jarid did joke about needing a photo waiver, but didn’t actually present one, I’m including a few pictures of these fabulous chefs in action. An endeavor like this is not an inexpensive one, but if you’re anything like me, it’s totally worth every penny (plus tip). Two of my guests texted me that this was a once in a lifetime experience that they thoroughly enjoyed. I have to agree! If I had an endless amount of discretionary income, I would do this once a month (or more frequently!). I’m happy to report that five of the guests who had not been to Braise previously do plan to have dinner there soon! Also, by word of mouth (because I can be a big mouth), another several people in my network plan to swing by for a meal. Finally, during our dinner, our group of eight talked about taking cooking classes at Braise’s Culinary School as another fun outing. I have since learned that both Chefs Dave and Jarid are focused on this aspect of the business more so than the restaurant (which allowed other talented chefs to run the restaurant while they were graciously hosting my friends and me to a fantastic dinner!). Definitely something to explore further! Have you ever had an in-home experience with professional chefs preparing meals? If so, I’d love to hear about your experience. Oh my goodness, this all sounds totally incredible. AND they cleaned? *SWOONS* lol 😉 Looks like a night to remember, loved reading about it. What a fabulous night! I wish I could have you, Nick, and my whole circle of friends over for another version!